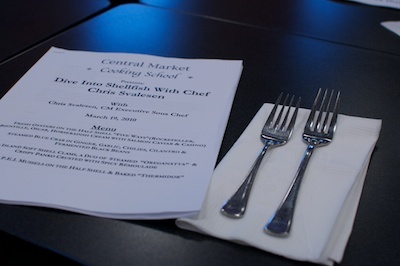 My man and I went to a cooking class dedicated to Shellfish: lobster, clams, mussels and five types of oysters. 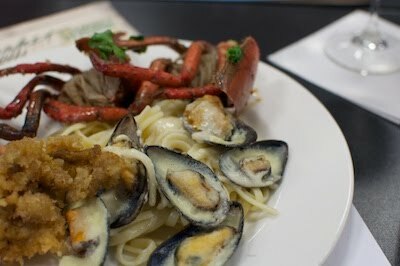 He got a new camera the same day, so here you have a fully-documented shellfish extravaganza. Then into the pot for him! Sauteed with shell on a mixture of ginger, soy, cilantro and fermented bean paste. 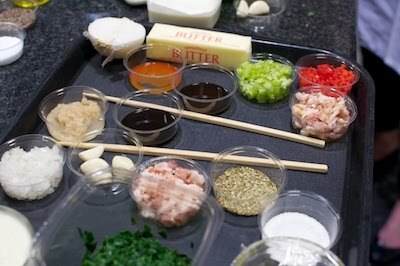 All the ingredients for our Oysters spread out, ready to go. I need these little plastic cups in my own kitchen. A good start to any recipe! Alcohol likes to catch on fire. Gratefully, we meant to do this. 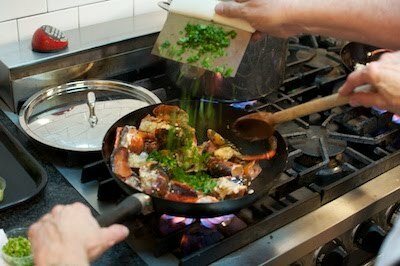 Oysters Rockefeller calls for a little flambe action. 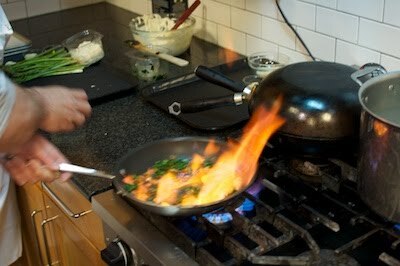 Add a little Pernod (licorice flavored liqueur) and let the gas flames get a hold of it. Topping the oysters before a quick blast under the broiler. I snuck a few raw ones. The final result: Fresh oysters on the half shell "five ways" (rockefeller, bienville, oscar, casino and horseradish cream with salmon caviar.) 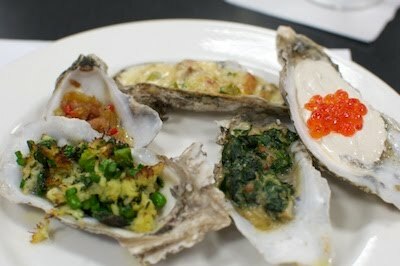 In my opinion, nothing beats a raw oyster, but adding butter and bacon sure does get close. And a few of our other creations: mussels thermidor over linguini, panko crusted clams with spicy remoulade and a little lobster cameo in the back. We also made a steamed clam dish that was my favorite. I ate them too fast for a picture. Favorite recipes below. Saute bacon. Add celery, onion and green peppers. When light brown add garlic, cream, salt and pepper. Cook until cream reduces to half, and add Parmigiano Reggiano. 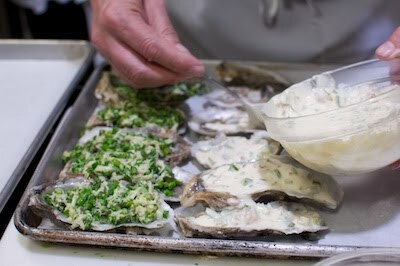 Place heaping mound on each oyster and broil for about 5 minutes or until slightly browned. Wash clams under cold water, being careful to not break their shell. Add red pepper and oregano to a dry pan over medium heat, and toast for about 2 minutes to release more of the flavor. 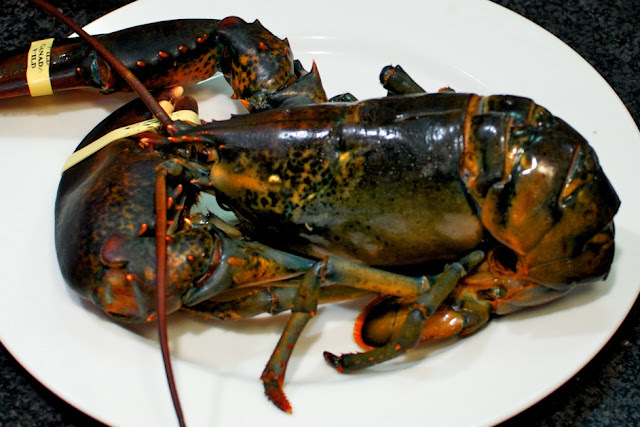 Add all other ingredients, and cook on high until the shells open, 2-3 minutes. 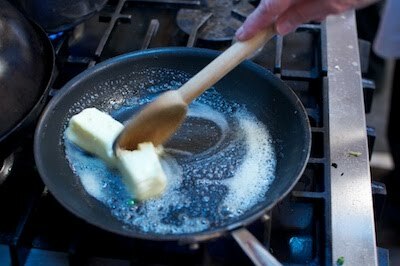 Serve in bowl with broth with a side of melted butter for dripping, dribbling, drizzling.